The first factor in a multiplication. In the equation 1/3 x 1/2, 1/3 would be the multiplicand. Factor options: If the multiplicand is a whole number only, leave the numerator and denominator blank. If the multiplicand is a mixed number, enter a positive integer for the whole number, the numerator, and denominator. If the multiplicand is a fraction only, leave the whole number field blank. The second factor in a multiplication. In the equation 1/3 x 1/2, 1/2 would be the multiplier. Factor options: If the multiplier is a whole number only, leave the numerator and denominator blank. If the multiplier is a mixed number, enter a positive integer for the whole number, the numerator, and denominator. If the multiplier is a fraction only, leave the whole number field blank.the numerator, and denominator. If the multiplicand is a fraction only, leave the whole number field blank. This is the result of multiplying the entered fractions, mixed numbers, and/or whole numbers. After calculating the product of fractions, the multiplying fractions calculator will show its work and give a detailed explanation of each step it took to arrive at this result. 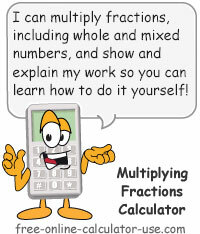 This calculator is handy for multiplying fractions and mixed numbers, and for multiplying fractions by whole numbers. And in all cases the calculator will restate the product fraction in simplest form. Plus, unlike other online fraction calculators, this Multiplying Fractions Calculator will show its work and give a detailed step-by-step explanation as to how it arrived at the calculated product. Also, be sure to check out my other online math calculators for help with fraction division and comparison. Enter the whole number, numerator (top) and the denominator (bottom) of the first factor (multiplicand). Enter the whole number, numerator and denominator of the second factor (multiplier). Note that for Step #1 and Step #2 you can either enter a whole number only, a mixed number, or a fraction only. Click the "Multiply Fractions" button. This will display the product of the multiplication and generate a step-by-step explanation showing how the calculator arrived at the result. The combination of a whole number and a fraction, such as 3 1/4 (three and one quarter). A fraction having a numerator that is larger than the denominator, such as 5/3. Enter the top number for each factor (multiplicand and/or multiplier) that contains a fraction. If a factor is a whole number only, leave the numerator and denominator fields blank. Enter the bottom number for each factor that contains a fraction. If a factor is a whole number only, leave the numerator and denominator fields blank. How to multiply fractions and mixed numbers. Multiplication is the easiest of all operations involving fractions -- because there is no need to worry about the denominators being like or unlike as in the case of adding and subtracting fractions. If you need to multiply a fraction by a mixed number, you first need to convert the mixed number to an improper fraction. To do that, you simply multiply the denominator by the whole number and add that product to the value of the numerator. That result then becomes the numerator of the improper fraction, while the denominator remains the same. Once you have converted the mixed number to an improper fraction, you simply multiply the numerators and denominators as usual. Once you have converted the whole number into an improper fraction, you simply multiply the numerators and denominators as usual.